Free Rice ~ it’s a very good thing! See? You just click on an answer, and if you get it right, 10 grains of rice appear in that bowl! The rice keeps adding up, the bowl keeps getting filled, and and United Nations World Food Programme really donates food to hungry people in the world! The link I’ve provided you takes you automatically to the English Vocabulary section. You basically guess word meanings. If you get it wrong, you are shown the correct answer and the question comes back randomly a few minutes later…so you really LEARN the word! But wait – you can change the subject! I’ve used this with students as young as 2nd grade, because it even has Math facts & multiplication tables! Older kids, teens, and even we grown-ups can even choose from a variety of topics such as Geography, foreign languages, S.A.T. prep, Literature, Anatomy…here’s a link to the various Free Rice Subjects. 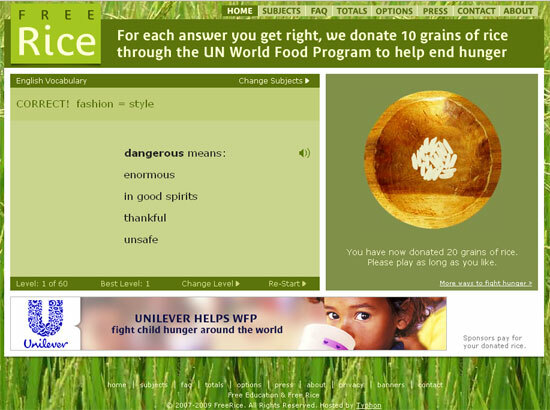 Freerice is a non-profit website that is owned by and supports the United Nations World Food Programme. Provide education to everyone for free. Help end world hunger by providing rice to hungry people for free. This is made possible by the generosity of the sponsors who advertise on this site. Whether you are CEO of a large corporation or a street child in a poor country, improving your education can improve your life. It is a great investment in yourself. Perhaps even greater is the investment your donated rice makes in hungry human beings, enabling them to function and be productive. Somewhere in the world, a person is eating rice that you helped provide.